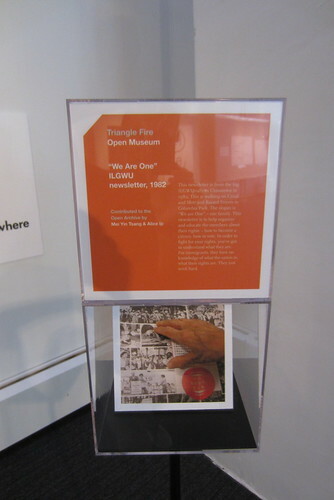 The Triangle Fire Open Museum is the tangible incarnation of our online Triangle Fire Open Archive, which explores the personal, political and historical legacy of the Triangle Fire through community-contributed objects. The Open Museum is a dispersed intervention : we created museum cases for real and replica objects from the Open Archive so that they could be found in locations across the city critically connected to immigrant, women’s and labor rights. The museum was launched at the NYU Open House from March 20-March 25, 2012 and then made its way out into the city to its host sites. In April 2012, New Yorkers were able to take a self-guided tour to find the objects around the city at The Tenement Museum; The New York City Fire Museum; Workers United; Museum of Chinese in America; The Murphy Center, CUNY; and The Fashion Institute of Technology. Images of objects at our host institutions. Find all the Triangle Fire Objects around NYC!